There are several types of columns which are used in different parts of structures. Column is a vertical structural member that carry loads mainly in compression. It might transfer loads from a ceiling, floor slab, roof slab, or from a beam, to a floor or foundations. Commonly, columns also carry bending moments about one or both of the cross-section axes. 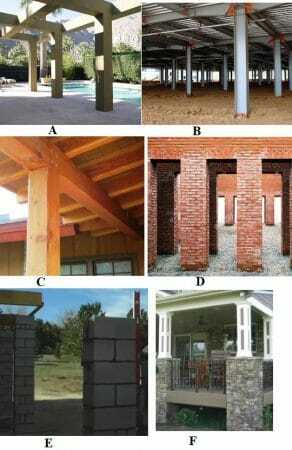 In this article, different types of columns used in building construction will be discussed. This type of column is commonly construction from reinforced concrete. Longitudinal reinforcement are confined within closely spaced tie reinforcement. It is estimated that 95% of all columns in buildings are tied. Spiral column is also construction from reinforced concrete. 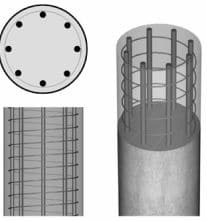 In this type of column, longitudinal bars are confined within closely spaced and continuously wound spiral reinforcement. Spiral reinforcement provide lateral restrains (Poisson’s effect) and delays axial load failure (ductile). When the longitudinal reinforcement is in the form of structural steel section or pipe with or without longitudinal bars, it is called as a composite column. This type of column have high strength with fairly small cross section, in addition to exhibit good fire performance. 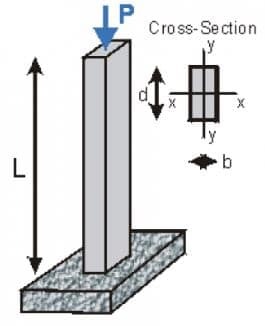 If vertical axial loads act on the center of gravity of the cross-section of the column, then it is termed as axially loaded column. 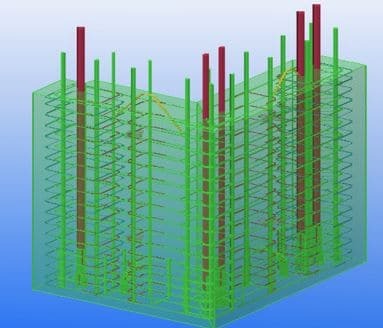 Axially loaded column is rare in construction since coinciding vertical loads on the center of gravity of column cross section is not practical. 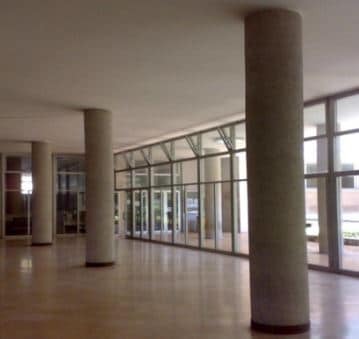 Interior column of multi-storey buildings with symmetrical loads from floor slabs from all sides is an example of this type of column. When vertical loads do not coincide with center of gravity of column cross section, but rather act eccentrically either on X or Y axis of the column cross section, then it is called uniaxially eccentric loading column. 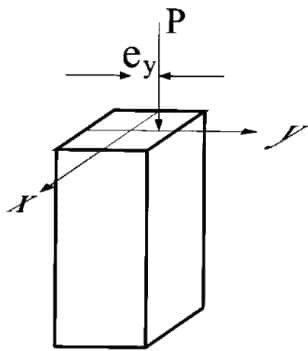 Column with uniaxial loading are generally encountered in the case of columns rigidly connected beam from one side only such as edge columns. When vertical on the column is not coincide with center of gravity of column cross section and does not act on either axis (X and Y axis), then the column is called biaxially eccentric loaded column. Columns with biaxial loading is common in corner columns with beams rigidly connected at right angles at the top of columns. If the ratio effective length of the column to the least lateral dimension is less than 12, the column is called as the short column. A short column fails by crushing (pure compression failure). If the ratio effective length of the column to the least lateral dimension exceeds 12, it is called as long column. A long column fails by bending or buckling. They are generally used in the construction of buildings. 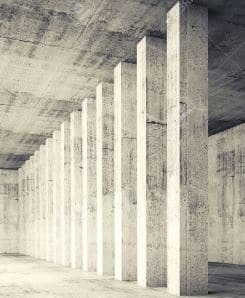 It is much easier to construct and cast rectangular or square columns than circular ones because of ease of shuttering and to support it from collapsing due to pressure while the concrete is still in flowable form. They are specially designed columns, which are mostly used in piling and elevation of the buildings. Commonly, L-shaped column is utilized in the corners of the boundary wall and has similar characteristics of a rectangular or square column. It is utilized based on design requirements of a structure. T-Shaped column is widely used in the construction of bridges. 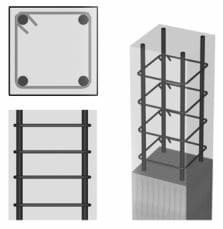 There are different standard and built up shape of steel columns which are shown in Fig. and Fig. 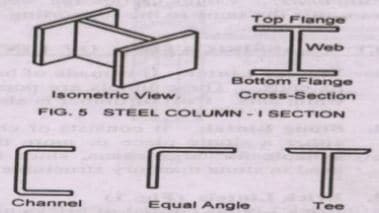 Common shapes of steel columns include I, channel, equal angle, and T-shape. The usual shape of composite columns are shown in Fig. 14. Reinforced Concrete, Steel, timber, Brick, Block, and Stone Column.